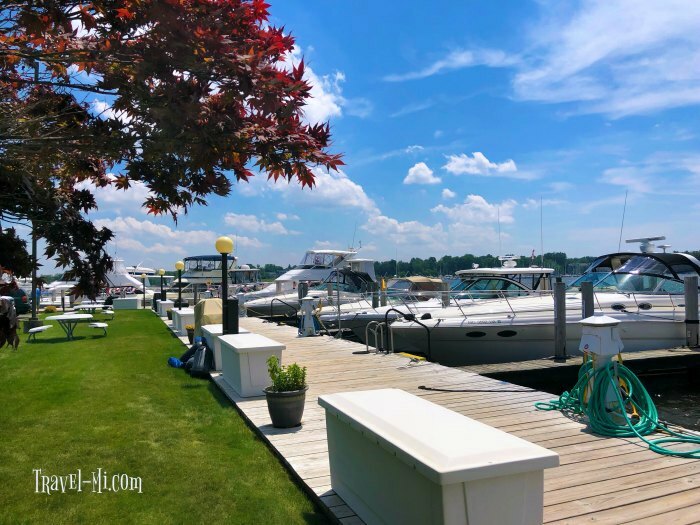 Discover the BEST Things To Do in Saugatuck Michigan! 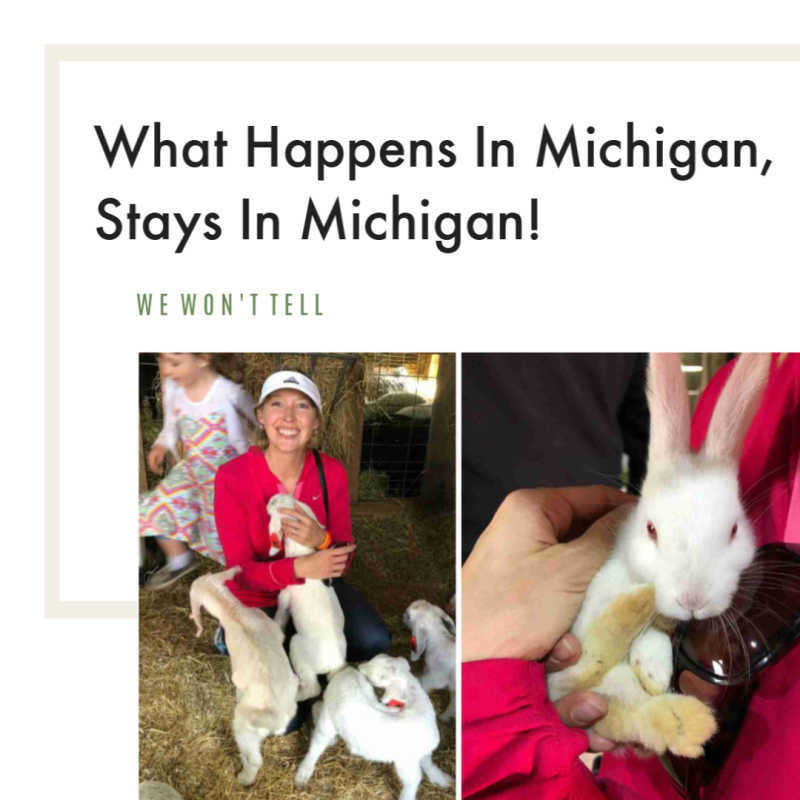 This friendly Michigan city has awesome art, beach, boating, breweries, river walk, ice cream and yummy restaurants galore! See why you need to visit! We followed the dotted line and arrows northbound into the city. We ended at the "H" and then backtracked counterclockwise around Kalamazoo Lake toward Mt. Baldhead and Oval Beach. When visiting a new city we like to drive through it first before parking so we can get the lay of the land. We parked right in front of the Chain Ferry which is a perfect central location. This city is great for walking, dining, exploring, shopping and relaxing. However, you will notice that our day was centered around experiences so I didn't list the numerous cute shops. You will have fun finding them on your own as you explore the town. 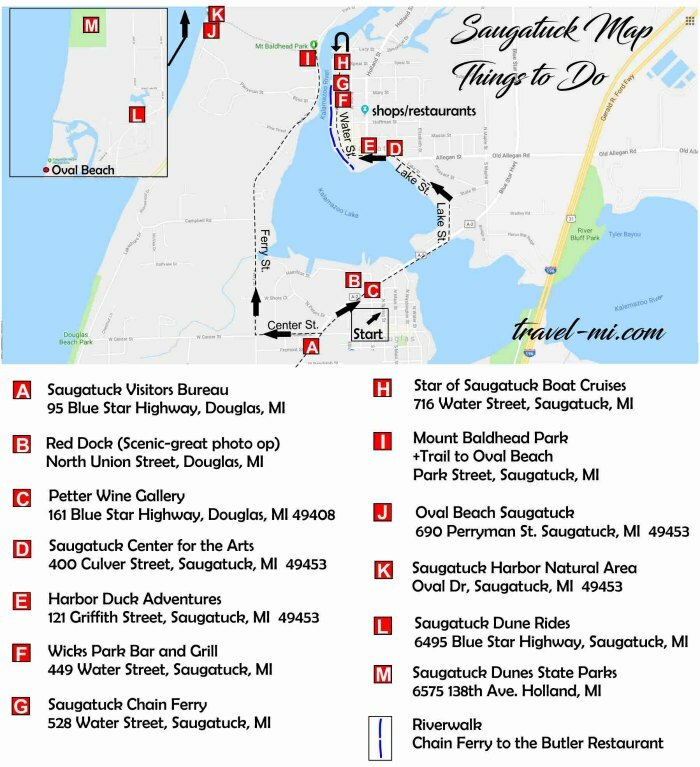 There are so many fun things to do in Saugatuck you will never be bored! If you are coming into the city from the south on Blue Star Highway be sure to stop at the Visitor's Bureau for more ideas and brochures. The Visitor's Bureau has great information about current events and festivals occurring in the city. Plus it's a great place to start your day. The Visitors Bureau is located on the right side of the road before the bridge. Red Dock-I love it here! Just happened to stumble upon this scenic while driving into the town. We decided to stop and check it out. I'm so glad we did as we discovered a fantastic spot for great photos and a peaceful walk along the water. You don't need to stop for long, it's a great place to jump out and stretch your legs and wander around. Plus I love anything with boats, water and exploring! The grounds are maintained but the parking lot is dirt. J. Petter Galleries- stroll through the gallery to view a good collection of paintings, sculpture, glass, and more. As an added bonus you can savor a glass a wine as you enjoy the art!! I mean what's better than wine and art?? Saugatuck Center For The Arts-We really enjoyed popping into the Saugatuck Center For the Arts. When we visited there was a free exhibit featuring work by Michelle Stitzlein. The installation was titled Industrial NatureWorks. Ms. Stitzlein's pieces are constructed with recycled objects which utilized materials that would otherwise be sent to a landfill. The colorful hoses and found objects create a deep impact for the viewer. I really liked the strong depth and contrast of colors, materials and shapes. 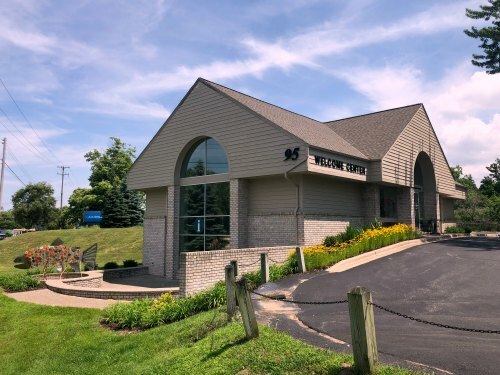 In addition to art installations, Saugatuck Center For the Arts has a variety of live theater productions throughout the year. 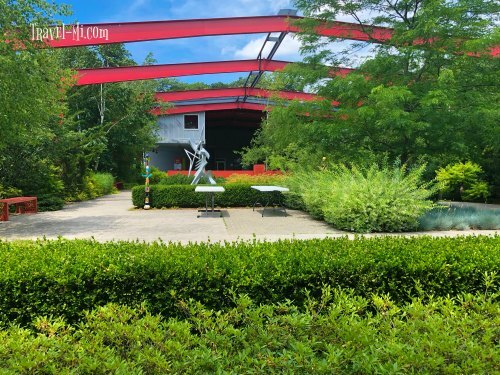 It's a great place to check out while exploring and finding fun things to do in Saugatuck! Harbor Duck Adventures- Looking for a view of the town and a splash in the water?! Grab some tickets and join the fun! 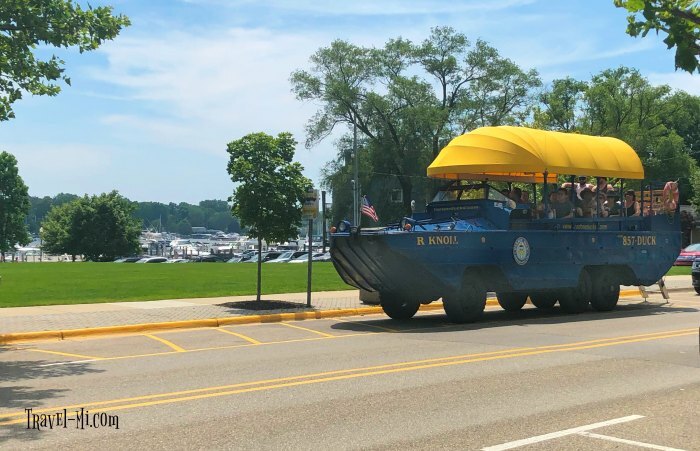 Harbor Duck Adventures Co. has transformed a World War II Army amphibious vessel into a big colorful water taxi that seats approximately 20 people. 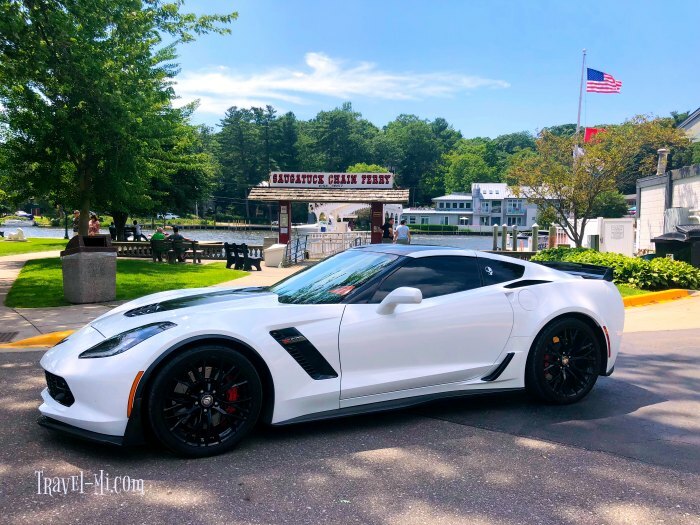 Tours drive through downtown Saugatuck and across the bridge to Douglas. Once you arrive in Douglas, you will get the chance to hop off the Duck and explore the village for an hour. What a great opportunity as you don't have to drive there on your own and find parking! After you've investigated Douglas, you'll hop aboard the Duck and ride it back to Saugatuck. BUT WAIT? I THOUGHT DUCKS SWAM!? Don't worry, the best is yet to come! 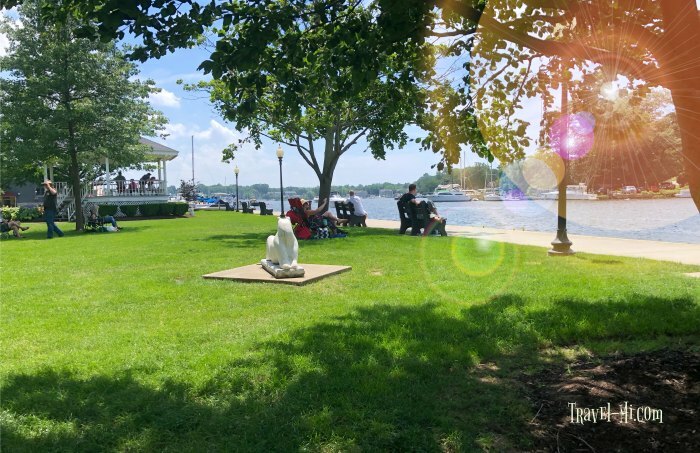 As a grand finale, the Duck will then splash into the waters of the Kalamazoo River and Saugatuck Harbor to give you a cool view of the river and Saugatuck. Pick up is on Culver Street across from Coughlin Park. NOTE: Cash only. 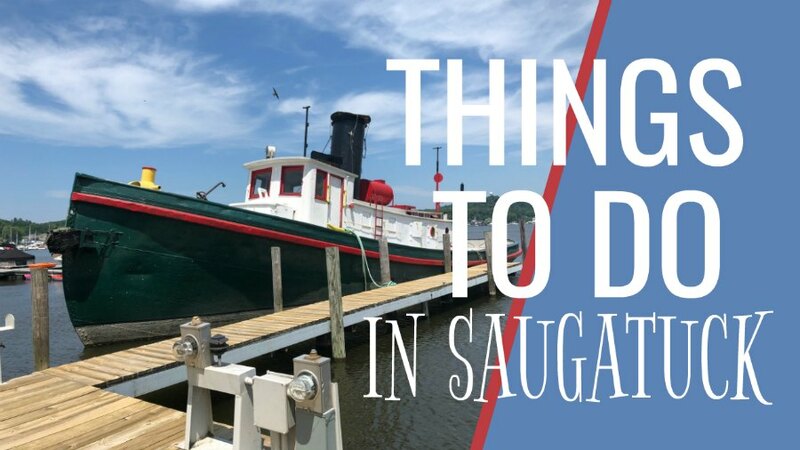 Definitely one of the fun things to do in Saugatuck! We enjoyed some fantastic food at Wick's Park Bar and Grill. We have photos and our reviews here! 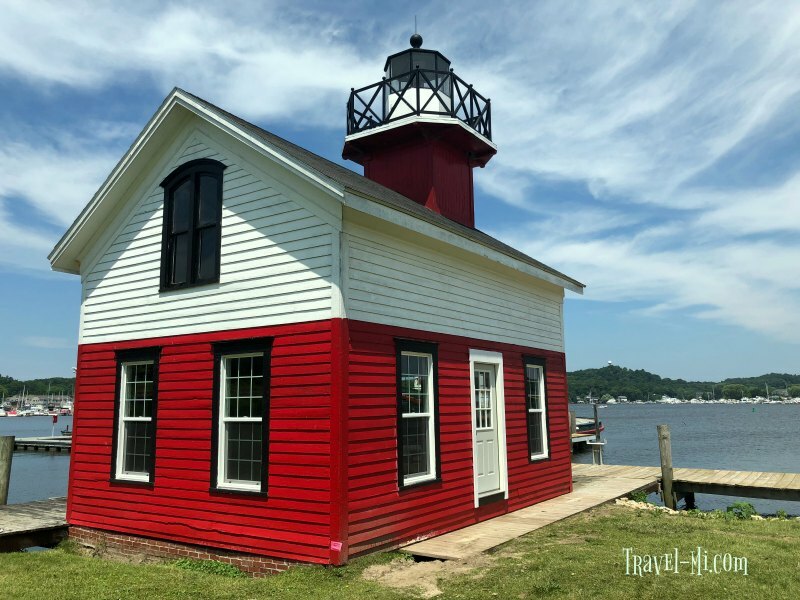 The Saugatuck Chain Ferry is a great way to get to the other side to visit Mt. Baldhead. I mean of course you can drive there, but why? This way is WAY more fun. Plus we had to position our car in front of the Chain Ferry for a cool photo op! It only costs $1 to cross each way using cash only. Children 2 and under, pets and bicycles are FREE. 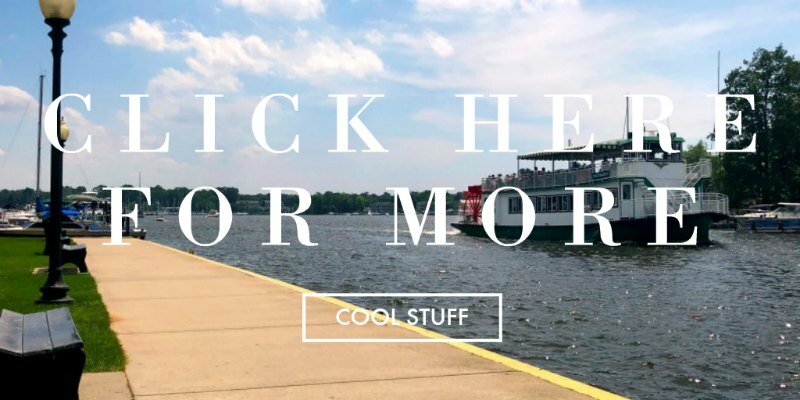 Where else can you get on the river with someone else doing all the work for only $1? I'm game. About the Chain Ferry: The chain ferry DIANE is a U.S. Coast Guard documented vessel. The chain is continuous and 400’ long. It goes thru a series of gears that pulls it from one side of the river to the other with generally two operators. The chain ferry operates in good weather only, so if it's windy, stormy or raining the ferry will not be operating. 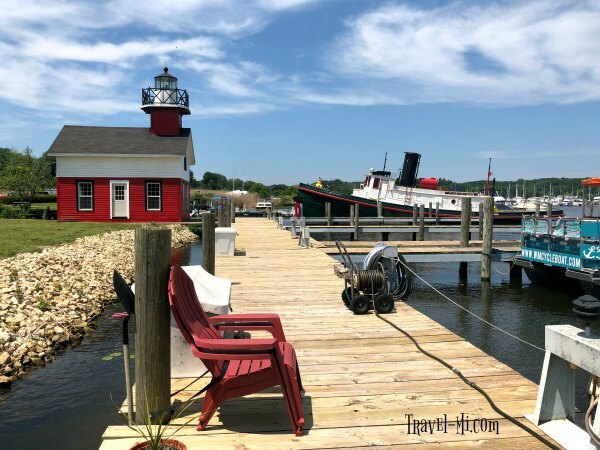 You should definitely add the Chain Ferry to your list of Things to Do in Saugatuck. This fantastic park features several benches on which to relax while watching boats sail by. 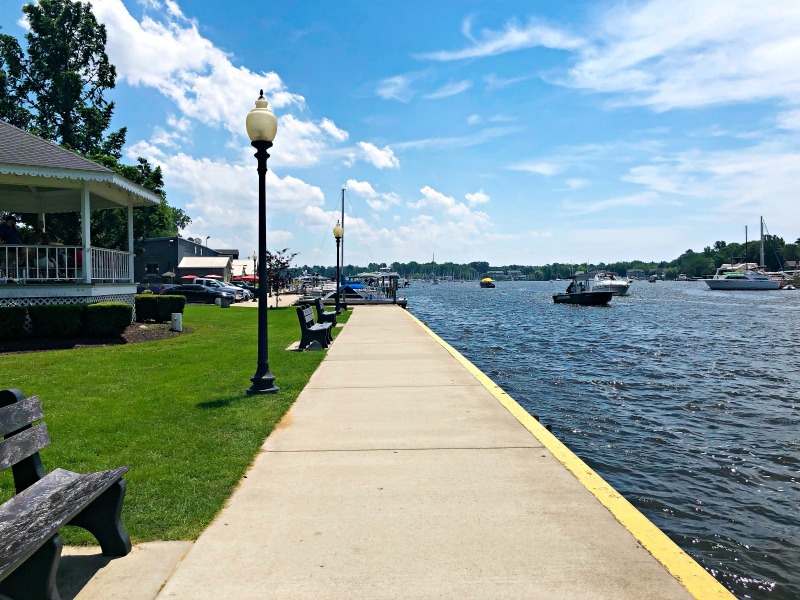 Numerous trees provide shade on hot days and you'll see the Star of Saugatuck float by as their hub is just a stone's throw away from the Chain Ferry. The park features a gazebo and restrooms. 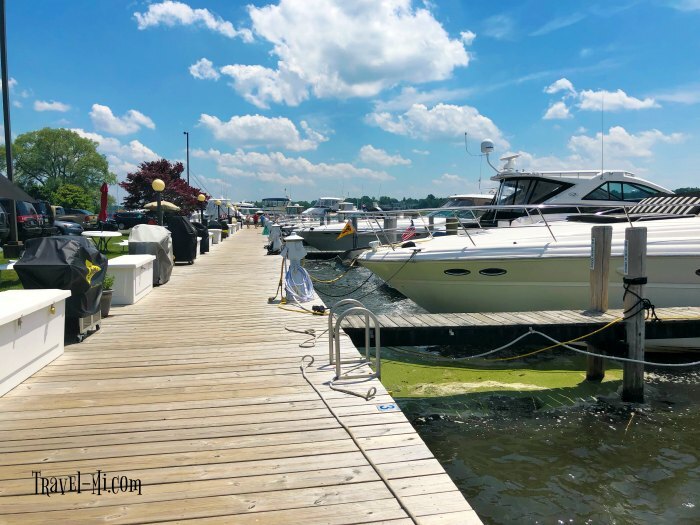 Saugatuck Riverwalk-A great place to start the river walk is at the Chain Ferry. We loved walking along the paved path that meanders along the river. The path brings you past numerous riverside restaurants and shops while offering an amazing view of the river and docked boats. Wasn't the day just spectacular? 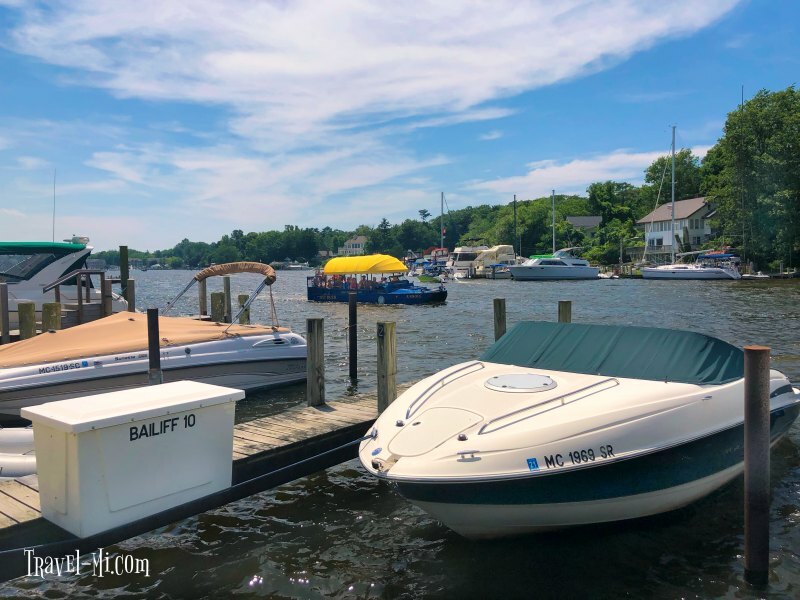 Puffy clouds, gorgeous weather, sparkly water and beautiful boats. I just adore summer. But Wait, There's More Things to Do in Saugatuck!!! Stops H-M from the map above are located on the next page! !